It's still March 10 here in the States, but it's March 11 now in Japan. I hope we can all take a moment to remember those who have been affected by the earthquake, tsunami, and nuclear disaster and also support and help those still going through difficulties in any small way we can. Although my family has been going through a lot this past year, I feel it fades in comparison, and my mind sometimes goes back to that day and following weeks. It's not something I can forget. And my post last year at this time says it all really. I do want to share today's guest post with you from WaNavi Japan. If you're living in Japan or planning to move there at any time in the future, I recommend preparing yourself (and family, if applicable) as much as possible. Have an emergency kit. Stock some dry food and lots of water. Know where to get information, especially if you don't understand Japanese, so you can protect yourself (and your family). WaNavi Japan explains more about all this below. Everyone knows that Japan is an earthquake-prone country, but the events of March 2011 made it much more real for many of us living in Japan or considering a move to Japan. It’s easy to think that since you can’t predict when or where an earthquake will occur, or what damage will result, you can’t do much to prepare for one. We can learn how to be prepared by seeing how Japanese society prepares and educates their citizens to respond to earthquakes. Disaster risk management includes both planning for and responding to disasters. In Japan planning starts early -- young children are educated about how important it is to stay safe. They learn to hide under a table or cover their heads when the shaking starts or when they hear an earthquake early warning alarm. When you feel shaking, try to protect your head and stay calm. Once the shaking stops, you need to get accurate information and respond appropriately. The more you know about the information sources available to you and what information you need, the more likely you will be able to stay calm and make the best decisions about how to react. 1. Yurekuru Call is an app available for iPhone and Android that sends you a warning if an earthquake might occur in your registered location, which is part of the nationwide early warning system. Many Japanese telephones have this function already built into the phone, so it’s worth asking your mobile company about this if you decide not to go for a smartphone. 2. The Disaster Emergency Message Dial (171) is a voice message board for communication when a disaster such as an earthquake or volcanic eruption occurs and telephone traffic to the disaster-stricken area increases making it difficult to transmit calls. By entering your landline phone number as a pin code, you can leave a message on the system where other family members who share the same landline number can listen to your message and record theirs as well. See this link for a helpful animation explaining how the system works. The system prompts are all in Japanese, but if you follow the steps you can still use this valuable tool even if you don’t understand Japanese. You can access the 171 system on the first and 15th of each month to practice. Set a date with your family and practice as soon as you can! 3. NHK television (Channel 1) is the best place to get fast, reliable, visual information on the location of an earthquake and whether a tsunami warning is in effect. Under the Broadcast Act, NHK (Japan Broadcasting Corporation) is obligated to broadcast early warning emergency reporting when natural disasters strike. NHK is able to source information from the Japan Meteorological Agency’s national network of seismometers and deliver information about the quake almost instantly. The image above is an example of the type of information you would see on the screen if there is no risk of a tsunami. 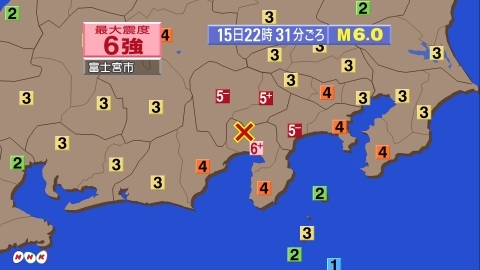 It includes details of the epicenter of the quake, the magnitude and the impact in each prefecture using the Japanese shindo scale. 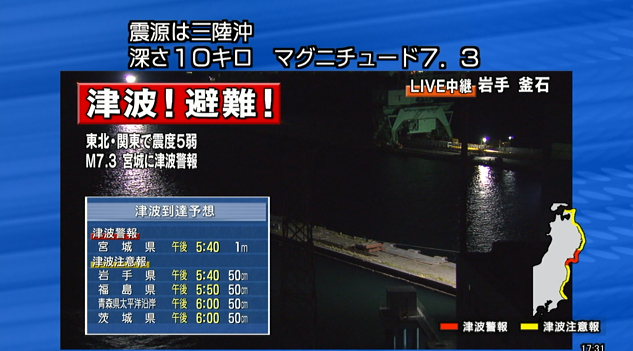 The screenshot above shows that there is a risk of a tsunami coming and you should evacuate from low-lying areas near the water without delay. The map shows the affected area and the table shows the expected arrival time and projected height of the tsunami. NHK World broadcasts in 18 different languages, so you can also seek information there, though it will not come through as quickly. You can access NHK World online here. 4. 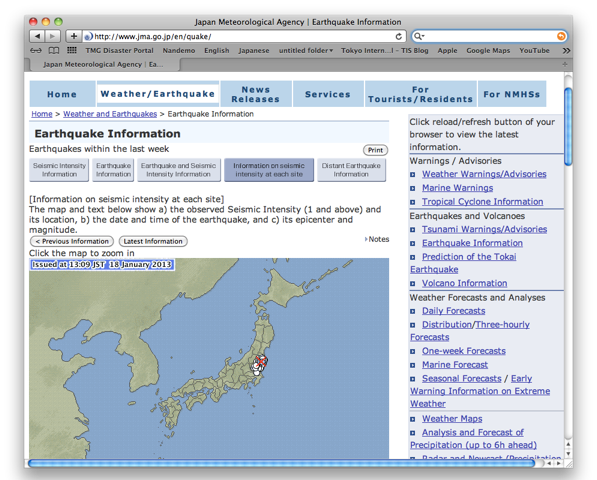 The Japan Meteorological Agency (JMA) website is bilingual and has lots of information about earthquakes, tsunami warnings and typhoons, among other useful information. 5. English-speaking radio broadcast frequencies include Inter FM (76.1FM Tokyo, 76.5FM Yokohama), Eagle (810AM) and the bilingual format of NHK (693AM). Prior to or in the event of an earthquake, follow the steps below to reduce your risk of injury and improve your quality of life in the immediate aftermath. 1. If possible, rent an apartment or house built after 1981 when the stricter building codes were established. The newer the better as a few amendments were made to the code in 2000 after analysis of the damage caused by the 1995 Kobe earthquake. 2. Know where your designated earthquake shelter is located. This may be important if your home becomes unlivable or you need to access supplies, such as food or drinking water. Ask at your local ward office for copies of bilingual evacuation maps and shelter locations. If you have any problems finding this information, feel free to contact WaNavi Japan for further assistance. 3. Choose a meeting place to reunite with your family and practice your home evacuation drill. 4. 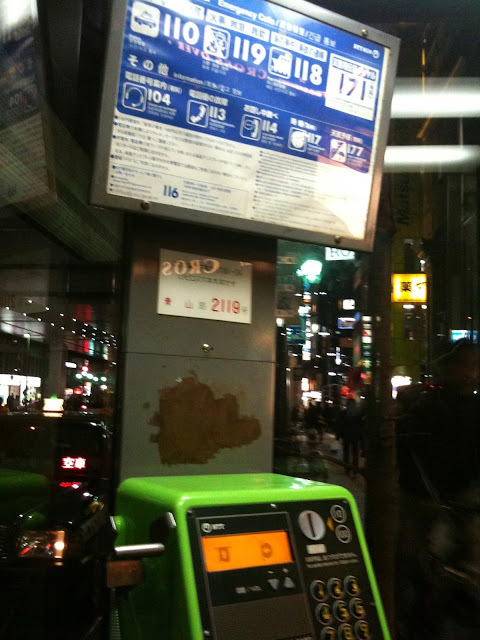 Walk your local neighborhood and locate public toilets and telephones. 5. Register for information alerts from your ward office and your country’s embassy. 6. If you have children attending school or child-care in Japan, know the school’s/care center’s emergency plan and how to make contact with your child’s teacher or caregiver. 7. Have multiple ways to contact your friends and family including home phone numbers (not just mobile/cell numbers). Connect on Facebook, Twitter or other online networks. Practice using the 171 system (available on the 1st and 15th of every month). 8. Stock up on supplies of essential food, medicine, drinking water and waste management tools. If water supply is affected then you might need to store lots of poop until services are re-established! See our resources page for a helpful checklist. 9. Pack an evacuation bag including cash, passports, essential medication, food, water and spare clothes for each member of your family. Ensure that you regularly change the clothes for the changing seasons and as the children grow. 10. Investigate ways you can secure furniture in your apartment to prevent it from falling during an earthquake. Your ward office may provide subsidies to offset the cost. A quick trip with a Japanese speaker to Tokyu Hands or a home store should have you on the right track. 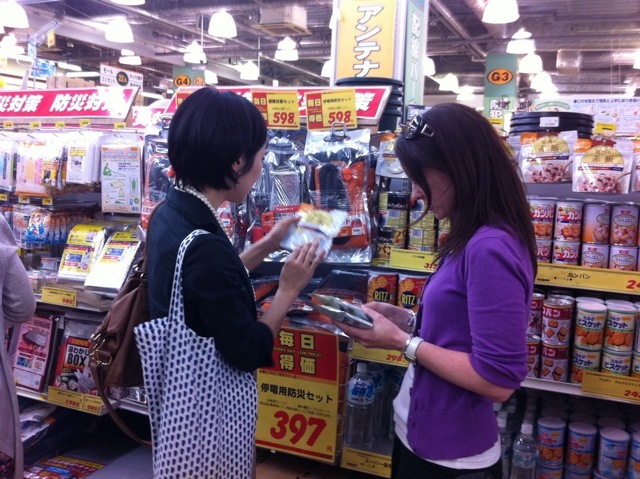 If you live in Tokyo, you can join WaNavi Japan on one of our regular escorted shopping tours. At a minimum, you need to secure your refrigerator and any TVs or tall bookcases. Try to store heavy objects on lower shelves if possible. Do not place heavy paintings or mirrors above beds. Did you know that a magnitude 7.0 (or greater) earthquake could occur anywhere in Japan at anytime? Japanese seismologists, like our advisor, Dr. Satoko Oki (Earthquake Research Institute, Tokyo University), work tirelessly to research and analyze various disaster scenarios and how they may impact people and life-sustaining infrastructure (such as water and electricity) in order to advise local and national governments on their disaster risk management plans. Detailed research is regularly carried out for scenario planning purposes (even more so since March 11), which highlights areas most at risk for damage from a tsunami, for example, and what the expected worst-case level of inundation from a tsunami would be in various locations. All residents and institutions in Japan (including foreign-owned schools and companies) are expected to have made a reasonable effort to prepare for emergency situations. All people in Japan are encouraged to “save your life by yourself” (自分の命は自分で守る!) and to not depend too much on civic instructions (Source: http://readytokyo.com/). 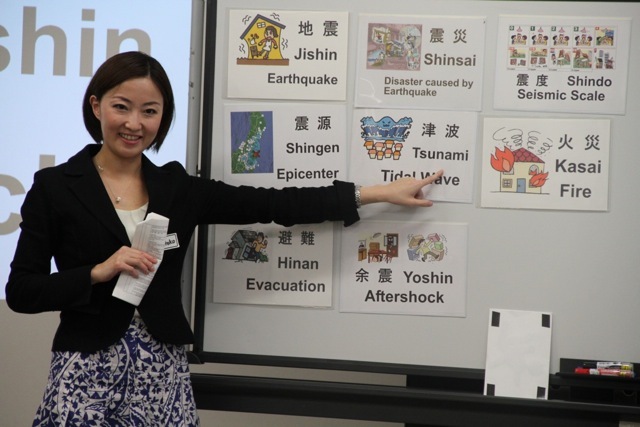 To increase your earthquake literacy try to attend any briefings or workshops organized by your company, children’s school or community group, if available, or contact WaNavi Japan for details about how to organize one! You should also attend any local hands-on “simulation” events organized by your ward office. The local fire station usually co-plans these, ask about "bousai kunren" 防災訓練 (emergency drills). Another important and potentially life saving step is to learn some basic Japanese words and phrases that may help you to respond correctly to instructions and requests from authorities. 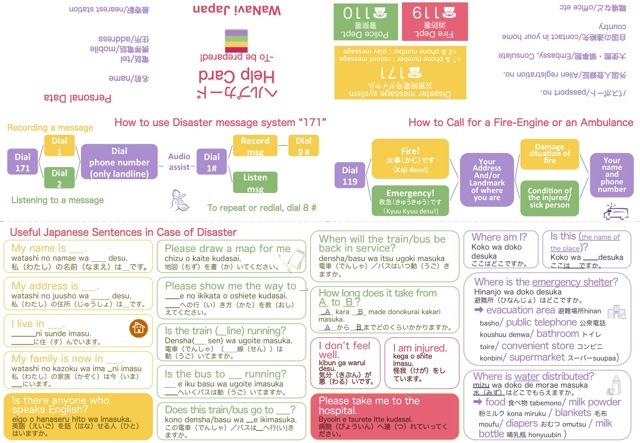 WaNavi Japan has designed a “help-card” which is provided to our workshop participants and is available free for download from the resources section of our website. This contains all of the critical words and phrases listed above, as well as a reminder about how to use 171, areas to record important phone numbers and passport numbers and a space to draw a map of your local area. Please customize and store in your wallet, just in case! In Japan, there is an old saying "備えあれば憂いなし, sonae areba urei nashi", which means, "be prepared and have no regrets". We hope you can start your preparations with our support, and if you have any questions please comment on this post or email us at wanavi.japan@gmail.com. WaNavi Japan is a nonprofit organization comprising professionals of multiple nationalities living in Japan. We provide international residents and their families with critical information and support to live comfortably and confidently in Japan through various services including workshops, networking, navigation, research, and consulting. WaNavi Japan regularly runs earthquake preparation courses at various international schools, universities, embassies and corporate orientation events in Tokyo, Yokohama and surrounding areas. 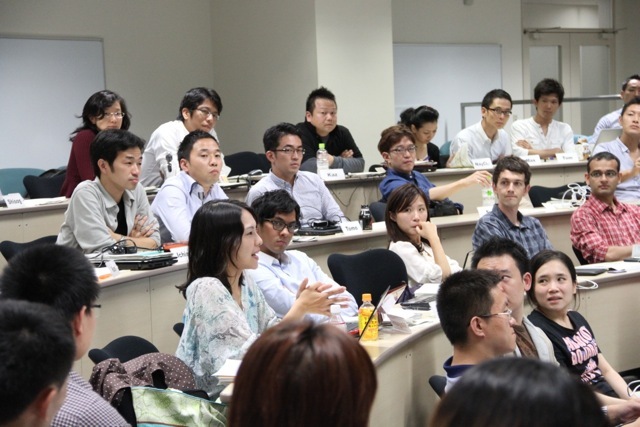 If you would like us to come to your school or office to discuss how we can tailor a course that meets the needs of your company, school or community group please contact us at wanavi.japan@gmail.com.